Several months ago I wrote a post entitled Online Journals I Admire. 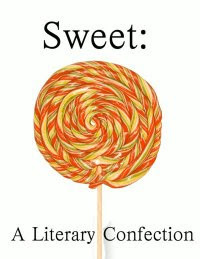 One of the journals I included was Sweet: A Literary Confection. Recently, I decided to try the journal with a submission. I'm happy to say that they took one of my poems for the current issue. My poem, Learning to Live Alone, is one of eleven poems in the issue. One of the things I like about this journal is that they limit the number of poems and poets in each issue. I find that I'm more likely to read when the journal is on the small side. I feel sort of overwhelmed when an online journal includes dozens and dozens of poets and poems. This issue also includes four pieces of creative non-fiction. Sweet publishes only poetry and non-fiction. I like that limited focus. The journal comes out three times a year, and each issue can be devoured in one or two visits. Another thing I like about the journal is the humor of the editors. They make me laugh. Check out their Masthead to see what I mean. And how could you not love a journal whose home page ends with this piece of good advice: Please remember to eat chocolate every day. My poem was initially entitled "Still-Life," a total loser of a title and I knew it. That was a perfectly appropriate title with a juicy dual meaning. But how many poems have had that title? I'll bet dozens. So I just sat on the poem for weeks until I came up with something better. The new title, "Learning to Live Alone," adds, I think, something new to the poem. I love titles. Here's a picture of something else I love. The editors ask each contributor to reveal his or her favorite dessert and that information is included in the bio note. 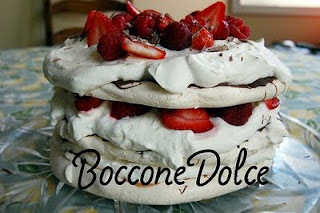 Thus mine ends: Her favorite dessert is Bocconi Dolci. We're talking three layers of meringue, each lightly covered with melted chocolate, each slathered with homemade whipped cream and sliced strawberries. The name means "sweet little mouthful" and is it ever. 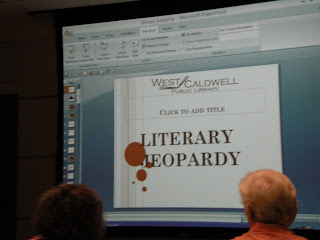 A few weeks ago I was invited to participate as a contestant in my local library's first-ever Literary Jeopardy. 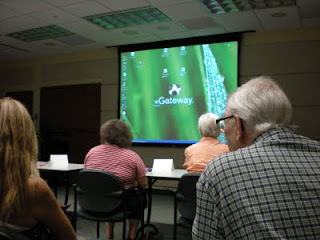 This event took place this past Tuesday. The above is what I saw when I entered the room. When I saw a total of only eight contestants, I became hopeful that I might win one of the three prizes. The odds seemed good. Then this came onto the screen. No, that's not blood splatters. There would be no blood shed that night though the competitive spirit was lively. Our game host reviewed the rules. Note that we did not have to respond with the answer as a question. I was glad as it has been quite a few years since I watched that show and I'm out of practice. 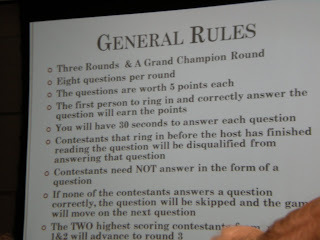 We played in two rounds, four contestants each. Two contestants failed to show so the audience was called upon. Two people volunteered to substitute. Then each contestant was given some kind of noise-maker in lieu of a buzzer. And the first round began. The two winners would return for round 3. Then we moved onto round 2. I did not thoroughly disgrace myself. In fact, while I stupidly missed the Jane Austen question—had it in my head but was too slow ringing my bells—I redeemed myself by getting the Truman Capote question. I'm pleased to brag that I was one of the two winners of that round. Then onto round 3, the final round. I messed up. Here's the question I should certainly have had. It asked for the star of The Princess Diaries. I knew it was Anne Hathaway, but again was just a second behind my more nimble bell-ringing opponent. But missing that one hurt as Anne Hathaway went to Millburn High School when I was teaching there! Shame on me. Then poor listening skills cost me another question. That one mentioned Blanche DuBois, so I rang my bells and answered, "Streetcar Named Desire." Wrong! The question wanted the author's name, Tennessee Williams, which I knew, but I was trying too hard to make up for my lack of speed. 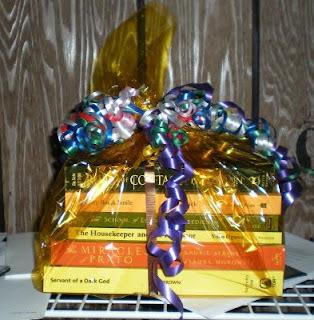 Nevertheless, I won third place and received a very nice prize. Six brand new books: 1) Rules of Contact, by Kristen Heitzmann, 2) Nothing But a Smile, by Steve Amick, 3) The School of Essential Ingredients, by Erica Bauermeister, 4) The Housekeeper and the Professor, by Yoko Ogawa, 5) The Miracles of Prato, and 6) Servant of a Dark God, by John Brown. Worst Question of the Night: What were the names of the original Three Little Pigs? The Poetry Party went really well. 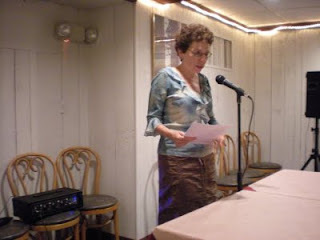 I was sort of nervous about the turnout as it was day 2 of Rosh Hashanah and there were two other readings going on not too far away, both with popular poets. 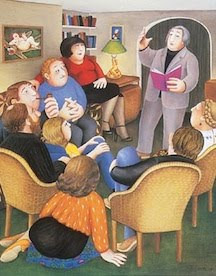 But we had 25 poets and a handful of people who were there just to listen. The theme, "When Arts Collide," worked very nicely. A few people even wrote and read poems just for the occasion. Others had a good time finding something that would fit. So we had poems about music and one that included some singing. Several poems based on paintings. A handful about the fine art of cooking. A few about dancing. All in all, a very interesting mixture. 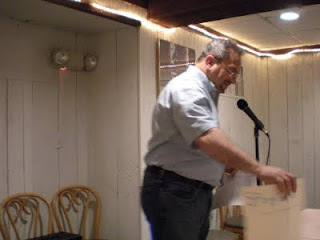 One poet, Ray Brown, sent me a note prior to the reading saying that he'd written a poem that had been inspired by my poem, "Organic Fruit," and a poem by Anthony Buccino. So we read those three poems, one after the other, with Ray last. How's that for a collision among poems? We went in two rounds with each poet reading one poem in each round. This method kept things moving right along. This also meant that all poets had the full room for at least one of their poems. Most poets stayed the entire time. In fact, I noticed only one leaving after she read her second poem. I kept the poets to a one-page maximum poem length. And I was strict! One poem each round, no more than one page each. And don't argue with me! Our poets ranged in age from 10-80! Some had been at the May Poetry Party. Others were first-timers. One was so anxious to read that he arrived a full day ahead of time. Fortunately, he returned a day later. Many of our poets were well-acquainted with the podium. One read for the very first time in public. Several stayed for dinner after the reading which was a fun way to end the day. I'm going to admit here that I often want to pull out my hair at an open reading. If I'm not the featured poet, I usually leave before they begin. If I am the featured poet, I almost always stay, but sometimes to my regret. If the host fails to enforce the time limits. If someone blabs on and on before, during, and after the poem. If readers are permitted to read more than two poems, regardless of how many readers have signed up. And especially if I see open readers in the audience working on their own poems while I'm at the front of the room reading! More especially when open readers arrive just as I'm finishing, just in time to be an open reader. But I know that poets want and need places to read. I've got a place. So I invented the Poetry Party and must say I've enjoyed both and plan to do another. Bring a few poems to read, ideally one which has some connection to another art form. 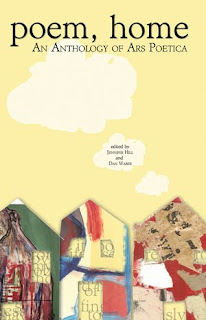 poem, home: An Anthology of Ars Poetica is about to be published by Paper Kite Press. The publishers, Dan Waber and Jennifer Hill, are now seeking pre-publication orders. The cover price will be $20 for this 230 page book which includes the work of 115 poets. 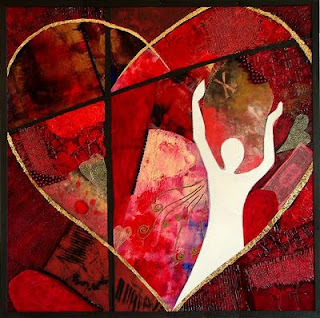 My poem, "My Husband Discovers Poetry," is one of those poems. This anthology has a rather unique birthing story. Several years ago Dan created a blog called Logolalia. He invited five poets to submit an ars poetica poem. He also invited each of those poets to invite five poets to submit. A poetic pyramid scheme. Submissions were thus by invitation only. Each of the poems was posted, one per day, at the blog. The plan was to eventually publish an anthology of those poems. If you go to the blog, you'll find links to each of the poems. The project grew to enormous proportions. I think it was about two years before my poem was posted. By then I'd pretty much forgotten about it. But just coincidentally, I met Dan and Jennifer before my poem was posted at the blog. They run a reading series at their gallery, Paper Kite Press Studio & Gallery, in Kingston, Pennsylvania. A friend recommended me for a reading in the series. The night of the reading, Dan and Jenn took me out for dinner. We never mentioned my poem or the anthology. What I remember best is a conversation we had about smoking, Dan and I both being recovering smokers. As ex-smokers always do, we talked about what had made us quit. Dan said that he'd decided he'd rather keep the 10-15 years smoking would take from his life and spend those years with Jennifer. I liked that story. About a year later, I was notified that my poem would appear on the blog. And quite a while after that I was notified that my poem would appear in the anthology. I think this should be a wonderful collection. Some familiar names: Kelli Russell Agodon, Mairead Byrne, Nick Carbó, James Cervantes, Denise Duhamel, Lynnell Edwards, Annie Finch, Lola Haskins, Paul Hoover, and Susan Rich. You can see the entire list of poets at the pre-ordering site. The book is scheduled for release in November. You can pre-order here. I've had two nice surprises this week. 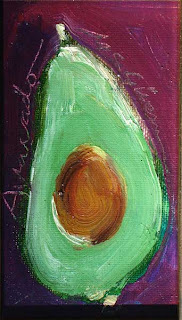 Today my poem, Organic Fruit, is featured at Your Daily Poem, an online site started several months ago by Jayne Jaudon Ferrer, a writer who lives in South Carolina. Similar in concept to Poetry Daily and Verse Daily, its intention is to enhance appreciation of poetry. Each feature includes one poem, an author photo, and purchase links. This site differs from the other two as poems are both old and new. Looking through the Archives, I found poems by Robert Frost, William Wordsworth, and Walt Whitman. 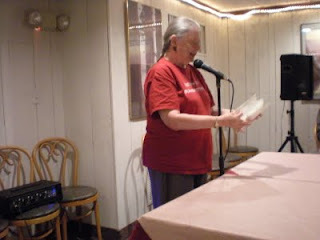 Contemporary poets include Dorianne Laux, Ellen Bass, and Louis Jenkins. Good company. I applaud Ferrer's effort to promote poems, poets, and poetry. If you go to the website, you'll see a window where you can sign on to receive the daily poems via email. 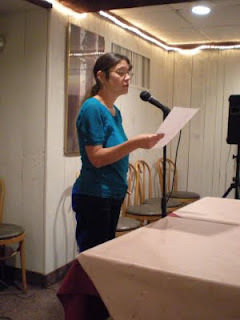 Yesterday my poem, Heart on the Unemployment Line, was featured at Alphabet Soup, a blog kept by children's author, Jama Rattigan. This blog reflects Rattigan's two loves—food and poetry. There are mouth-watering images of food as well as recipes. Then each Friday is a feast of words when a poem is featured. Two weeks ago my poem Eve's Confession was also featured at this site. Featured poems receive a substantial amount of commentary from Rattigan's readers. I'm happy to have work in the ninth issue of The Innisfree Poetry Journal, edited by Greg McBride. This issue includes the work of thirty poets, including Kristen Berkey-Abbott, Martin Galvin, Julie L. Moore, and Karen Weyant. One thing I like about this online journal is that the number of poets and poems included is reasonable, not overwhelming as I've sometimes seen at other online journals. In addition, this issue features fourteen poems from the books of Alice Friman in the "Closer Look" series. You'll also find Nancy Naomi Carlson's translations of five poems by René Char. Among other highlights are Nancy Fitz-Hugh Meneely's review of Pointing at the Moon, a terrific book of poems by Bill Wunder arising from his experiences in the Vietnam War. Just coincidentally, I've met Bill Wunder and will be reading with him in December. I've also read the book and concur with all the praise the reviewer gives it. I have three poems in the issue. One of them, "Pleasure," is a particular kind of form poem. See if you can figure out what the form is. (Thus I entice you to go visit the poem!) The poem, "Spying on My New Neighbors," really did begin with some spying, but not intentional spying. I was out taking a walk. As I passed the neighbors' house, through the trees I could see the young couple making out. It was a sweet and tender scene. A young couple in their first house, beginning a backyard garden, and spontaneously taking some time out for kissing. It also made me jealous! And then I wrote the poem. Put it away for a long time. Sort of forgot it. Rediscovered it and sent it to Innisfree where the editor quickly took it. I say "quickly" because this is one journal whose editor gets back to you nice and fast. I always appreciate that. So pay the journal a visit. And if you can figure out the form of "Pleasure," then I challenge you to attempt one of those yourself. Greg McBride is right now taking up the challenge.